Our wire ropes are sourced from reliable suppliers and are tested to comply with relevant Australian standards. In an earlier blog we posted titled, What You Need To Know Before You Buy Wire Rope in Australia, we discussed three key aspects of wire rope that you should consider before making your final decision. These considerations included the wire rope’s strength, environmental effects and testing the wire rope so that it suits your intended application. Here, we share with you 3 tips for choosing the right wire rope. There are many types of wire rope. Consider your options so that you choose the right wire rope for your project. For projects closer to the seaside, you might want to consider marine grade 316 stainless steel. For projects that will operate in sunny conditions, you might want a PVC coated wire rope that is resistant to the harsh rays of the sun. - Galvanised wire rope available in fibre core or steel core, in 6x7, 6x19, 6x24, 6x25, 6x36, 7x7, 7x19 constructions. - Stainless steel wire rope available in grades 304 and 316 in 1x19, 7x7 and 7x19 constructions. - Coated wire rope: stainless steel pvc-coated in 7x7 and 7x19 construction, pvc-coated galvanised in 6x7, 6x19 and 7x19 constructions. 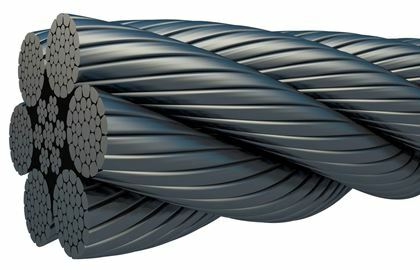 There is no one type of wire rope that boasts all features such as flexibility, strength, and corrosion, fatigue, vibration, abrasion, crushing and rotation resistance. There will always be a trade-off amongst these features and it is essential that you evaluate the features, your intended application and associated parts to the project so that you choose the right wire rope. For example, consider whether the wire rope will experience shockwaves, sudden acceleration of a heavy load, torsion, and exposure to wet and salty conditions. All these factors, and more, will affect your choice of wire rope. The wire rope you choose needs to suit the other parts to your project. Accompanying fittings such as shackles, wire rope grips, turnbuckles, eyebolts and eye nuts, need to complement your choice of wire rope so that your completed project operates effectively without any issues. At Keble’s Trading, we have a team of specialists who can help you determine the most appropriate wire rope for your needs that will suit your intended application. At Keble’s Trading, we are a wire rope supplier that has been in business for 28 years. Supplying Melbourne with high quality wire rope that has been selected to meet the needs of our customers, we understand what matters most. If you are interested in a long-term relationship with us, you can open an account with us and we will assign an account manager to give you a single-person contact for all your needs. Enquire today by calling 1800 067 687 or visiting one of our four showrooms today. Are you in the market for reliable, strong and long-lasting wire rope? What key features do you look for in wire rope?